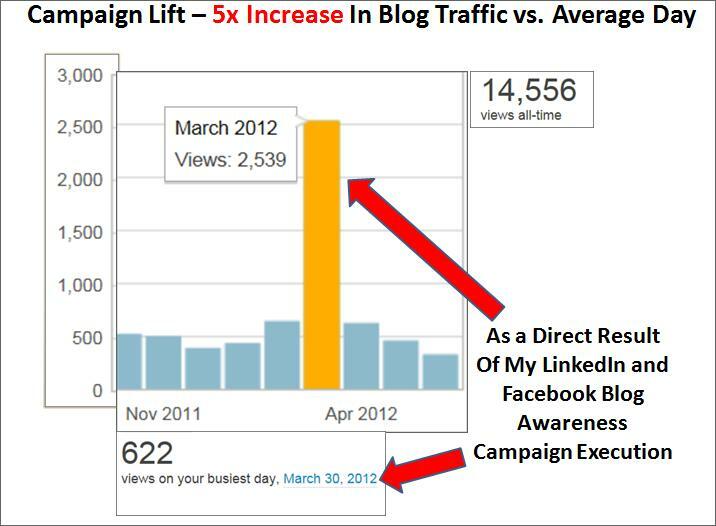 This next chart illustrates the results of my campaign which netted a 5x lift in monthly blog hits – an amazing increase over normal months! 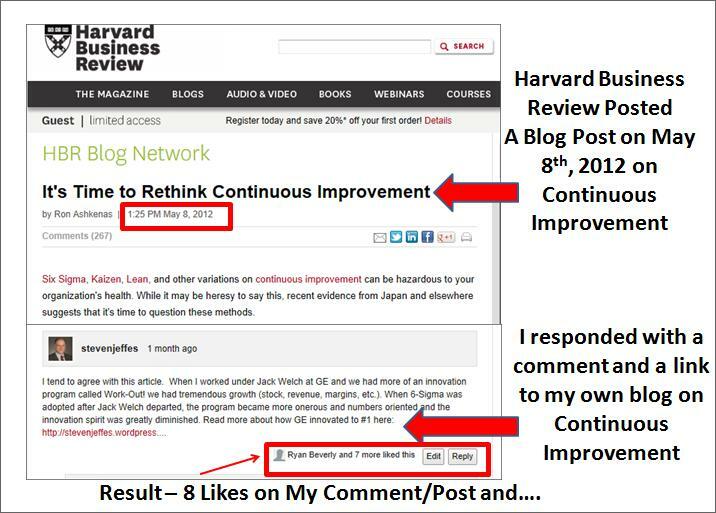 I next posted a comment and link to my innovation & continuous improvement blog in response to a blog post on the Harvard Business Review’s website on continuous improvement. 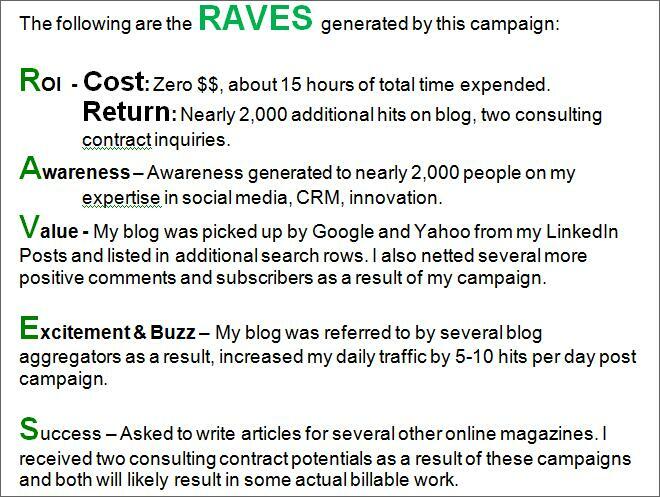 As a result, my blog hits (RAVES) went through the roof (see next chart), with 8 people liking my post on the HBR blog site. 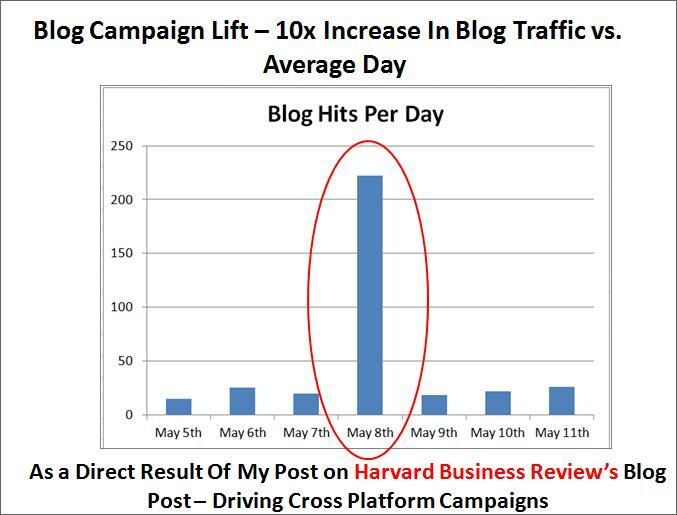 As shown by the following chart, as a result of my posting on The Harvard Business Review Blog site, the hits (RAVES) to my blog were 10x over a normal traffic day. 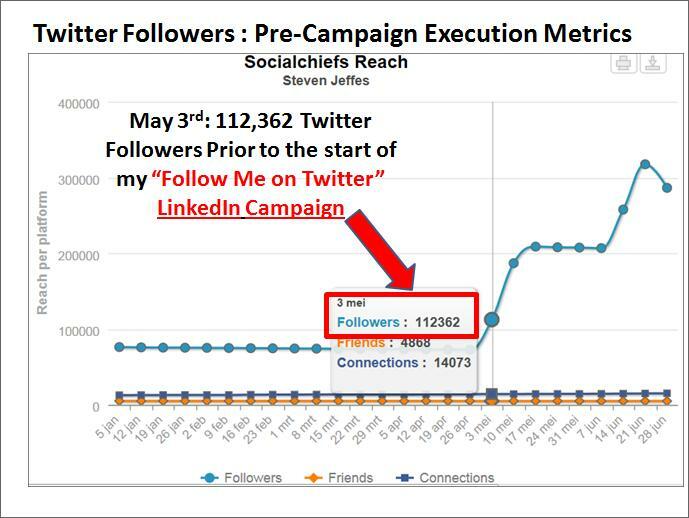 Next up in my campaign execution plan, and following a similar SCORE plan of the blog campaign, I set out to increase my Twitter Followers by sending messages to my LinkedIn Connections and Group Members to Follow Me on Twitter. 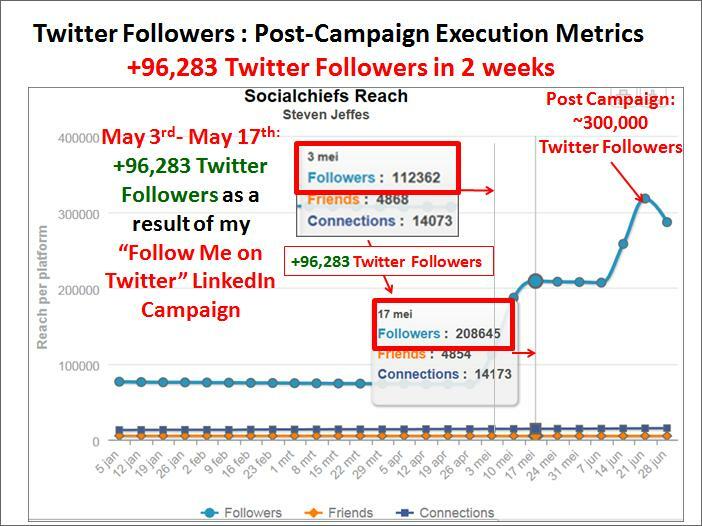 As shown by the following chart, the (post campaign execution) RAVES associated with this Twitter “Follow Me” LinkedIn campaign resulted in an additional 96,283 Twitter followers in just two weeks time and a post-campaign increase in daily Twitter followers of 50-100 per day. 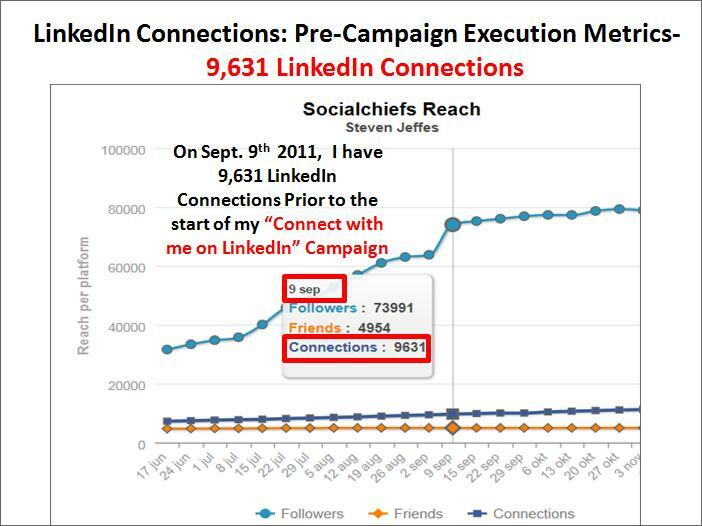 Next up in my campaign execution plan, and following a similar SCORE plan of the Twitter Campaign, I set out to increase my LinkedIn Connections by inviting my LinkedIn managed group members to connect with me on LinkedIn. 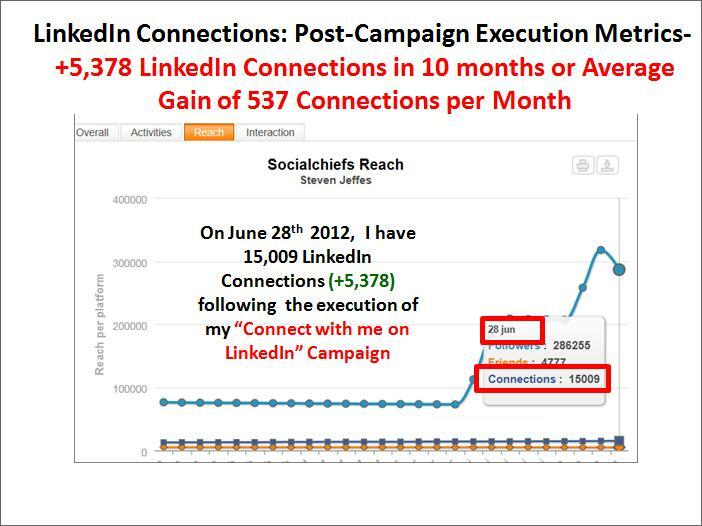 As shown by the following chart, the (post campaign execution) RAVES associated with this campaign resulted in a growth of LinkedIn Connections of 5,378 in just ten months time (an average increase of 537 LinkedIn connections per month) and a post-campaign increase in daily LinkedIn Connections of 5-10 per day. 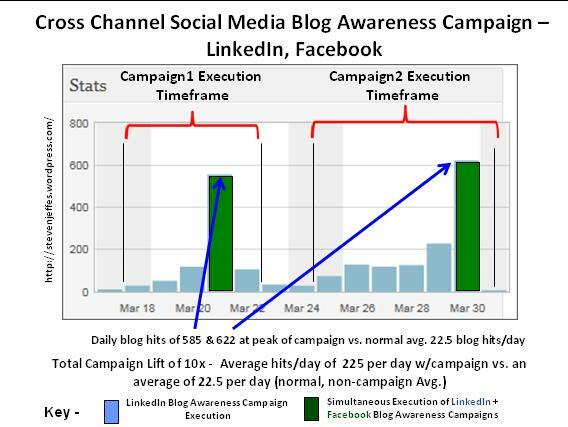 All of these above SCORE campaigns demonstrate the advantage of planning and executing successful multi-channel social media campaigns. 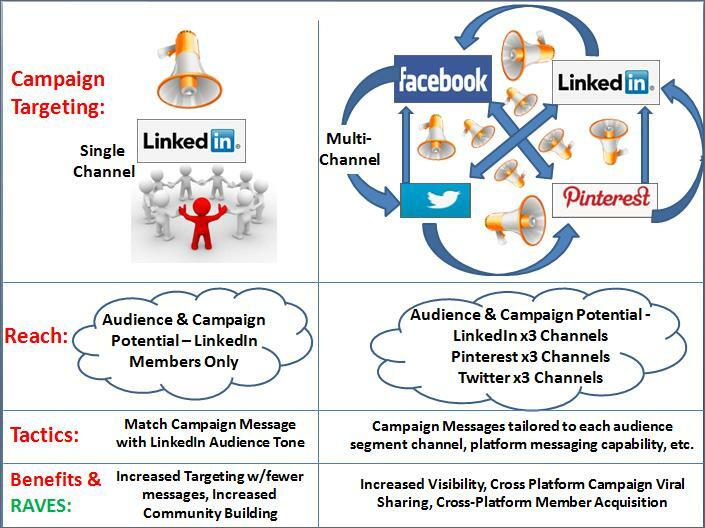 As illustrated above, while multi-channel social media campaigns have the highest potential reach, impact and RAVES, it comes with an entire set of more complex targeting strategies and communications tactics than does the single channel (i.e. LinkedIn only) campaign. 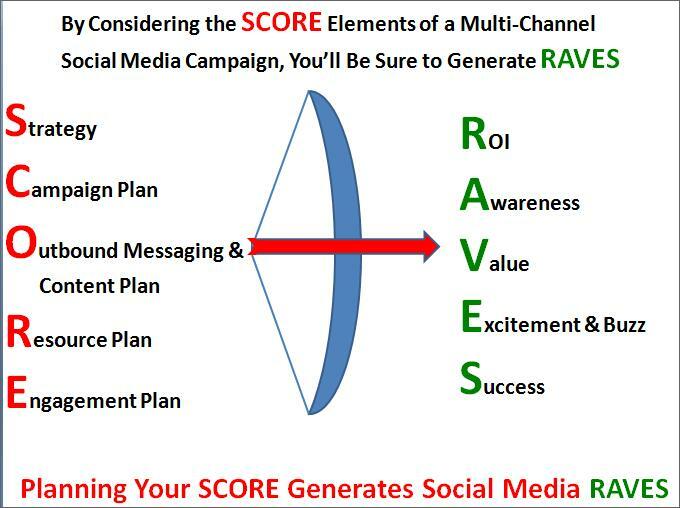 Obtaining RAVES with multi-channel social media campaigns therefore, requires much more time and effort in campaign (SCORE) planning. All of the above gives you some sample insights on how to SCORE RAVES with multi-channel social media campaigns, and achieve your own success by executing similar campaigns. 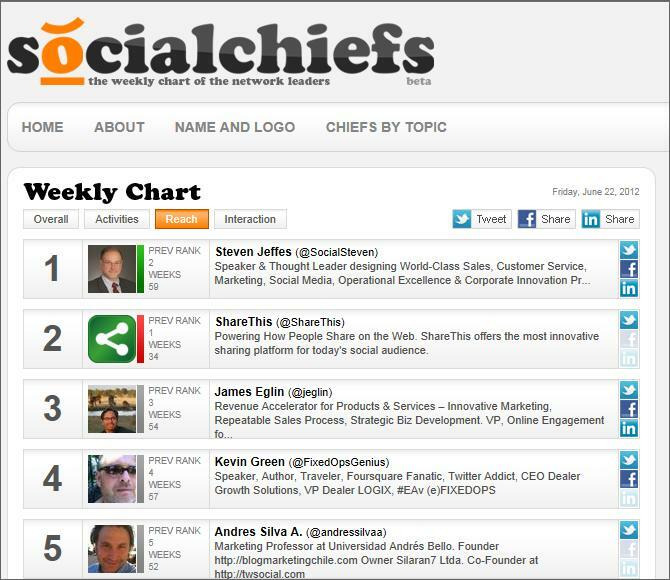 The end result of all this campaigning…?–>Me ending up as #1 among all global social media experts in social media reach (combined total of LinkedIn Connections, Twitter Followers and Facebook Friends) by SocialChiefs.com. As a result of this ranking, I have had numerous inquiries on speaking nationally on the topic of social media, social media consulting inquiries and inquiries to see if I would be interested in joining organizations as their social media lead/manager/director. In my previous blog, I covered the first of three mega-trends hitting the social media marketplace for large Fortune level organizations. 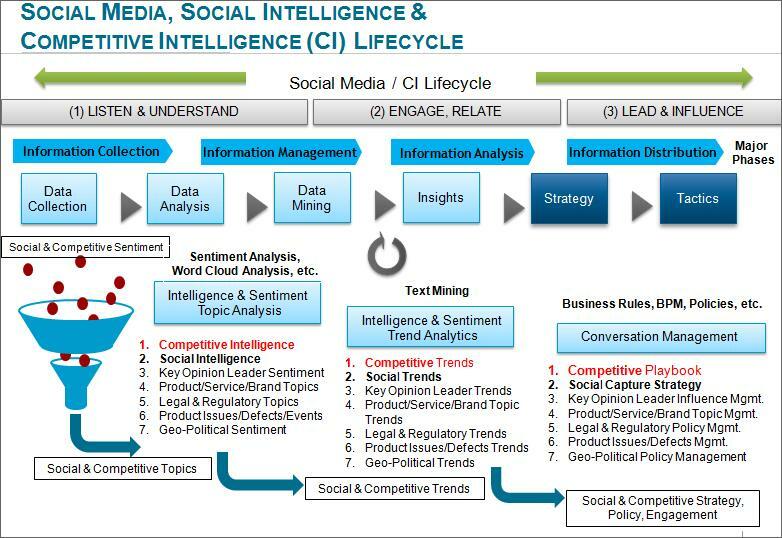 In this blog, I address how the use of enterprise social monitoring and intelligence platforms are helping companies leverage key insights from an array of market activity and major trends including competitor activity & weaknesses, key opinion leader sentiment/needs, regulator trends and concerns, political leader and influencer sentiment, public opinion and key issues. A) What is an Enterprise Collaboration Platform (ECP) or Intra-Social Application? 3) Integrates Communications and Business Processes – Integrates and accelerates the use of chat, video sharing, teleconferencing, blogging, video conferencing, etc. 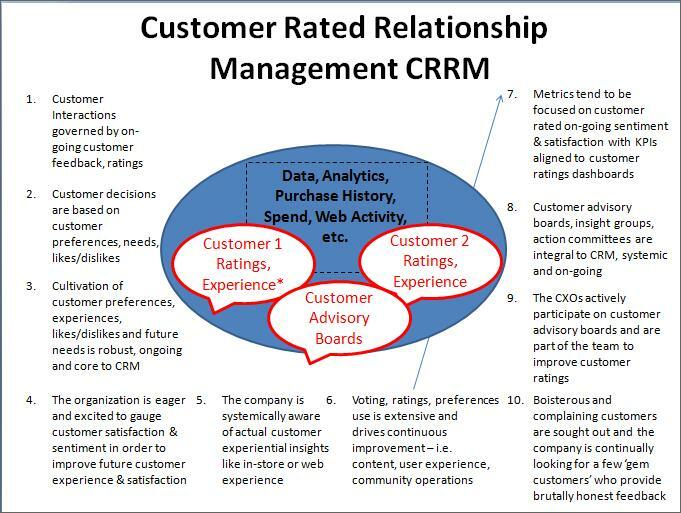 10) Companies who integrate and optimize ECPs with traditional market communications channels such as call center, web, mobile, e-mail, etc can benefit from a dramatic increase in the overall customer and stakeholder experience. 12) The overall goal of the increased internal collaboration and productivity derived from the ECP is to decrease the time to market with products and services that have increased market relevance. C) What are the hottest tools/applications on the ECP or Intra-Social Application market? Almost all ECPs are relatively new to the marketplace and few software vendors have deployed to more than a several Fortune-500 level companies. d) Group management and profiling. d) Team expertise profiling, etc. * IBM – IBM Lotus Connections. IBM was an early entrant into enterprise social tools, and this has enabled the IBM Lotus offering to remain in a leadership position. IBM Lotus connections has many of the same features/functions as Cisco Quad such as Communities, file sharing, Wikis, team profiling, blogs, team activity tracking, home page activity and preference management, etc. In addition to these features, the IBM offering has a Social Analytics function that facilitates the user on profiling those who might be good connections both on an individual level and community level. The IBM offering also provides mobile access to access the technology from a mobile device and also provides chat forums to share insights, ideas and concerns. * Jive with Microsoft SharePoint & SharePoint Connector: Jive in conjunction with Microsoft SharePoint is a very powerful collaboration platform. Jive is used as the hub for socializing and sharing content broadly across the enterprise. SharePoint can be used in conjunction with Jive with the SharePoint connector by integrating SharePoint with Jive, using SharePoint as the workflow and document storage system (what is was designed to be best at). Together, these two applications drive awareness of enterprise activities by socializing content and team activities, wherever it originates, to inform better business decisions. 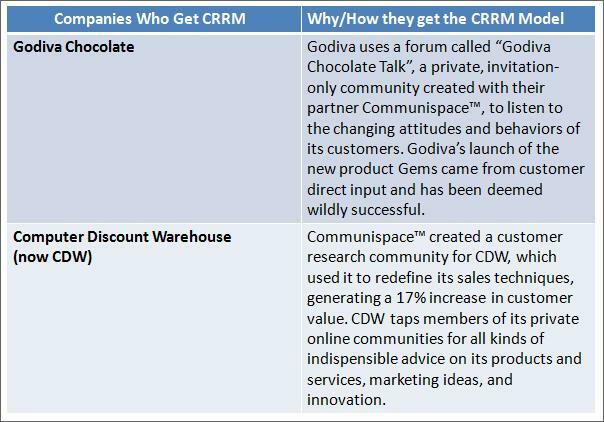 * SalesForce.com – Chatter. Following on their success with their Sales application, Salesforce.com has developed a very robust intra-social ECP application called Chatter which allows all people within the company to interact and collaborate on projects. Many times the Sales Force of a company will be the first to adopt this technology due to the fact that the sales force is already using the sales application, hence is a good pilot group to pilot the intra-social application. Similar to Cisco’s Chatter application, the features and functions are designed to maximize team interaction and collaboration so that teams can operate more efficiently by eliminating the need for many manual cycles to coordinate and conduct meetings, collaborate on documents and projects, and develop deep insights based on team specialization and expertise. * Oracle Beehive. Oracle Beehive is also a strong contender due to the size of the company, its existing installed base a relatively strong product line. Similar to many of the software vendors above, The Oracle Beehive product provides an integrated set of modular collaboration services including email, calendar, team workspaces, instant messaging, and conferencing. The companies below are considered challengers due to their smaller company size, relatively new entrance to the market place and/or their set of smaller customers that have their products currently installed. * Atlassian Confluence: Atlassian’s confluence product is mostly seen as a productivity wiki tool, geared toward technology departments. However, the product is highly extensible with integrations into Microsoft SharePoint and Lotus Connections. The product is also most geared toward content sharing, discovery, creation, etc. * Novell – VibeCloud. The company’s acquisition of SiteScape brought the company beyond email and calendaring and more into the collaboration space. Novell has many of the futures as some of the leaders above such as document management, social messaging, conversation tracking, group & community management, etc. * PBworks – PB Works appears to be geared to mid-sized companies in providing collaboration Software for Smaller Advertising Agencies (PB Works Agency Edition), Legal Firm, Consulting, Medical, Associations. * Socialtext: Socialtext was best known for bringing Twitter-like status functionality to the enterprise called “signals”. 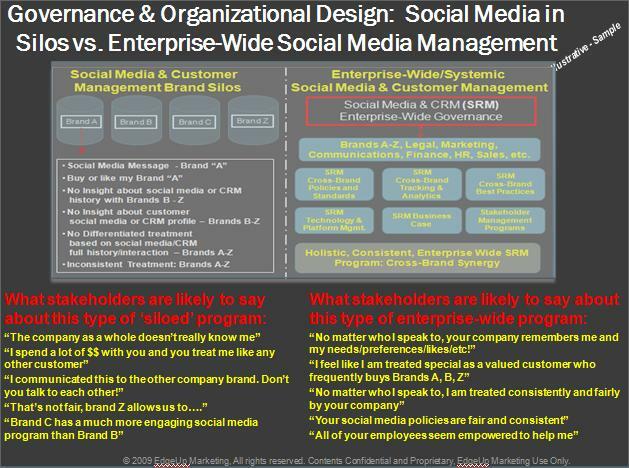 Social text has many of the same features as the leaders above, but is a smaller sized company than an IBM or Cisco. Socialtext also provides integration with Lotus Connections and Microsoft SharePoint. b) Develop ECP management processes that provide organizational confidence and exercise process excellence transparency to solidify user/stakeholder buy-in and acceptance. That last bullet point is not a typo as I would honestly say that the #1 main key to success in implementing this type of software is an extremely capable change management program. This type of software requires a behavior change on the part of your employees and management and it won’t come easily. I can say this with confidence – If you are not considering a heavy dose of change management as part of this implementation, your implementation is most likely going to fail! In summary, ECPs and intra-social applications are gaining a great deal of Momentum. Many Fortune 500 companies are either planning to implement this capability or already have. 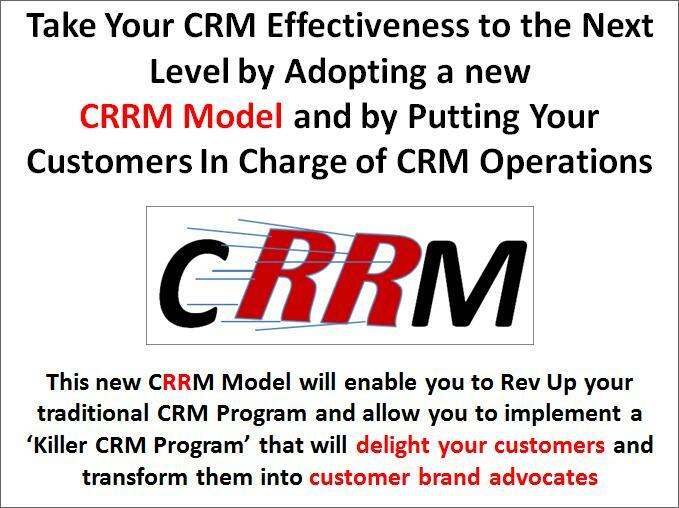 Is your organization planning on implementing this potentially game-changing capability? If so, give me a call, I call help you achieve world-class programs that enable you to surpass your competition and bring your organization or agency to the next level of market and intra-social collaboration capability. In my previous blog entry titled “Social Media Pitfalls and Mistakes – the Seven Deadly Sins of Social Media Programs”, I covered the major mistakes companies make when developing and managing enterprise level Social Media programs. One of the points that I focused on was not developing an effective governance model and organization in order to oversee and manage the strategic direction and overall success of a social media program. 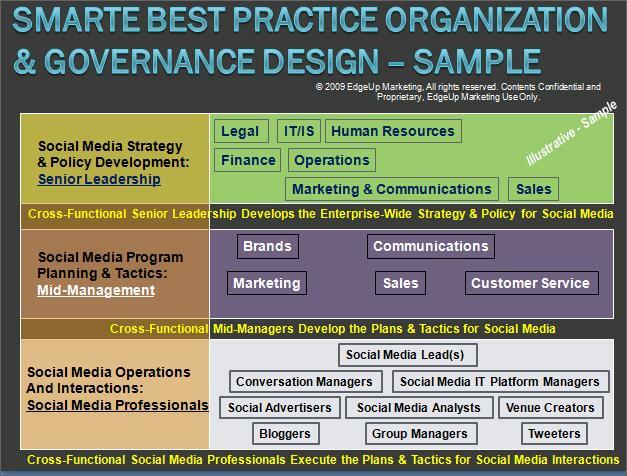 The following chart (Chart 1) from my firm’s SMARTE methodology depicts two different governance models for social media and customer management. 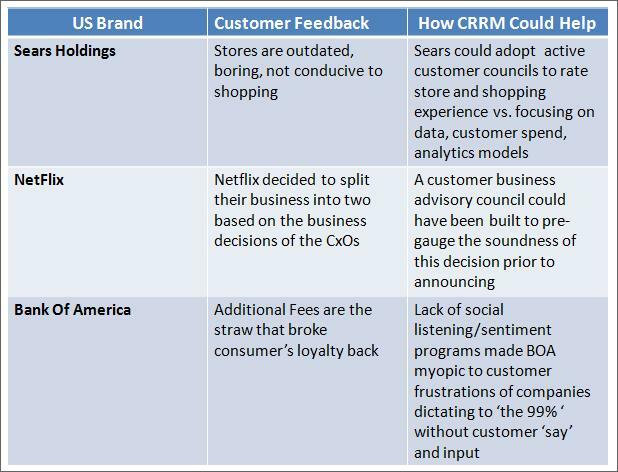 On the left, governance of social media and customer management is performed with brand silos, each having their own unique version of dealing with their stakeholders and customers. While each program is effective in each silo and meeting the needs of the specific brand, there are many issues created from a company and stakeholder management perspective. There also many missed opportunities in terms of revenue optimization and cost containment. 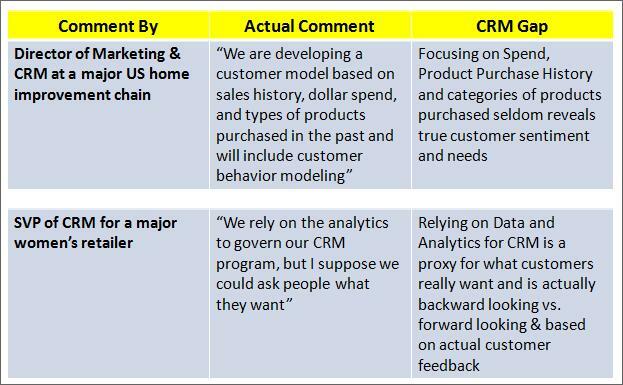 As seen below in Chart 2, the left side governance model in silos is much more likely to generate frustration and contempt from the customer’s perspective vs. the holistic governance model on the right. 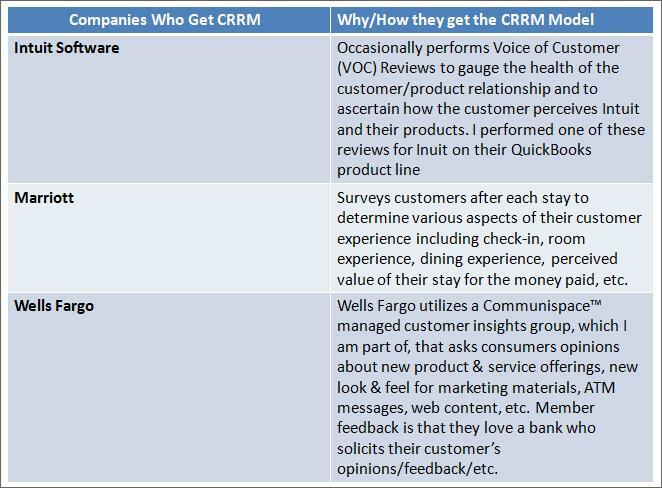 Refer to the following chart for a sample of the different types of customer comments each of these governance models is likely to generate. Obviously, the left side of the chart generates many more positive stakeholder and customer comments and it much more likely to result in higher customer loyalty, share of wallet, customer cross/up-sell opportunities and will generally result in lower costs and higher revenue. consistent, efficient and effective program delivery. 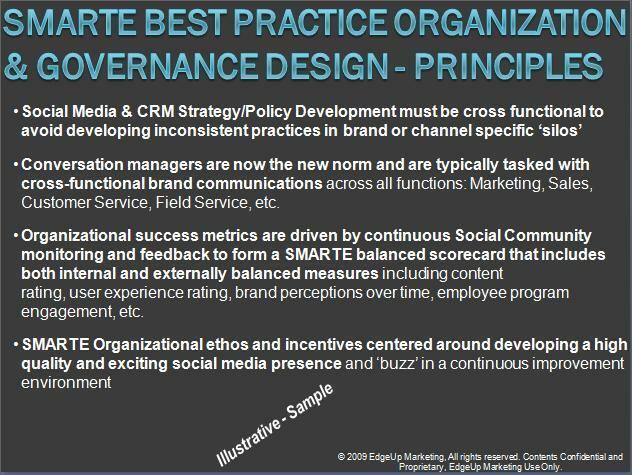 Based on my firm’s SMARTE methodology (SMARTE stands for “Social Media Adaptive/Responsive/Transcendent Enterprise”) and direct client experience, I have found that in order for Social Media and CRM programs to be highly effective, a company must develop and maintain an organization design and corresponding governance structure that maximizes the ability of the company to build and leverage enterprise-wide synergy. This governing structure must be built to avoid developing programs that exist in brand or channel specific silos such whereby everyone is developing their own flavor of social media and customer management that appears to the outside world to be inconsistent, unfair, non-relevant, unappealing or just another one-off initiative. 3. The department(s) that led the introduction of the social media program thinks they own the social media program and is attempting to control the program by dictating program rules, standards, policies, etc. 5. 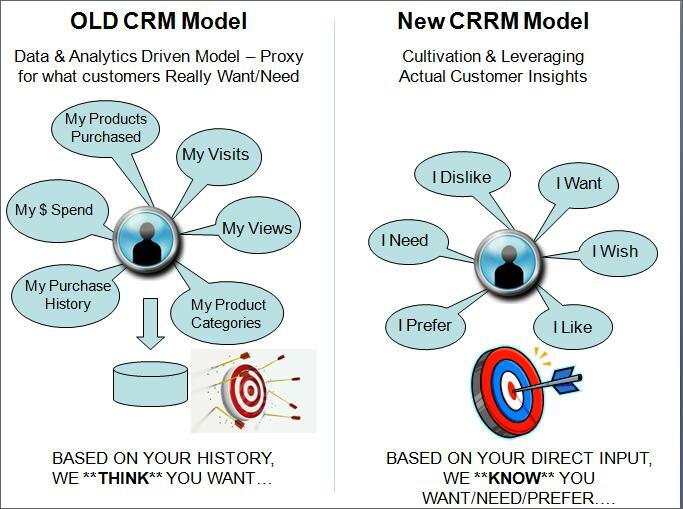 Social Media & customer initiatives seem ad-hoc and are really not driven by solid metrics, business cases, enterprise-wide strategic business plans, etc. 3. 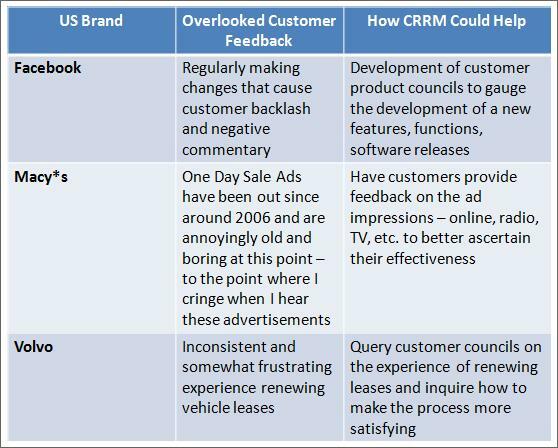 Stakeholders & customers find your company’s content and messages ad-hoc (vs. themed) in terms of relevancy, timing, venues by which messages are communicated, etc. These governing principles are accompanied by an entire set of practices and methods for developing a governance model and corresponding governing organization. These were developed following over 50 successful consulting engagements on Fortune 500 clients involving the development and/or improvement of social media and customer management programs. 2) Program planning and tactics must be developed by mid-managers who have direct expertise and responsibility for stakeholder and customer communications & touch-points. 3) Operations and Interactions must be carried out by professionals who are well versed in customer management, social media interactions (i.e. social media conversation managers – topic to be covered in a future blog post), and who are incentivized to optimize the customer experience to the point of best in class stakeholder and customer excellence. 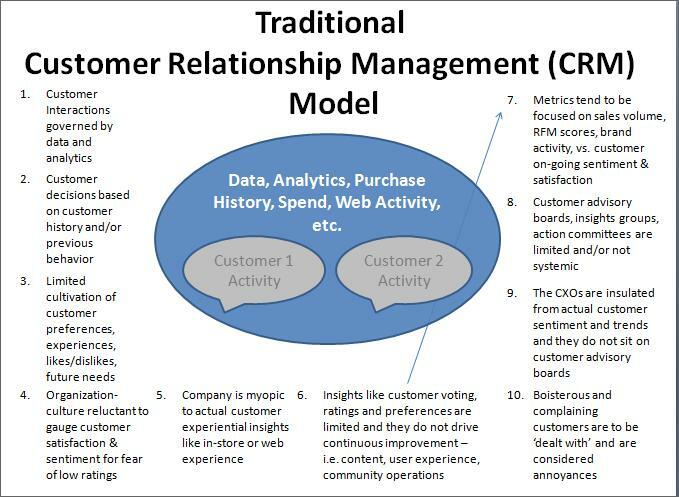 The bottom line here is that, without a strong and well thought-out governance model for customer management and social media, you will likely end up with a chaotic and ineffective program. Trust me I know as I am hired by many companies to help re-engineer the situation after they have gone awry. Anybody wanting to hear more about social media governance, please feel free to give me a call. Anybody else run into governance issues that they’d like to share? In my previous blog entry titled “Social Media Pitfalls and Mistakes – the Seven Deadly Sins of Social Media Programs”, I covered the major mistakes companies make when developing and managing enterprise level Social Media programs. One of the points that I focused on was not utilizing the correct key performance indicators (KPIs) in measuring the success of a social media program. This blog post will highlight the critical components in developing a highly effective social media measurement system and how to craft an effective social media balanced (measurement) scorecard. External Balanced Scorecard Metrics – How the program is perceived by external stakeholders and participants to be fair, engaging, referable, worth following, responsive, etc. Internal Balanced Scorecard Metrics: How the program is perceived by internal company stakeholders to be efficient, effective, systemic, consistent, compliant, repeatable, etc. If we place the external scorecard metrics in the numerator of the Equation and the internal scorecard metrics in the denominator the result is the Social Media Program Balanced Scorecard. Before we demonstrate an example how this balanced scorecard can be used, let’s take a look at some of the specific measures for both the external success metrics (balanced scorecard numerator) as well as the internal success metrics (balanced scorecard denominator) for this balanced social media measurement scorecard. 8. Content Referral Score: Rating by forum participants on how likely they are to refer people to the company forums, initiatives, contests, etc. 2. Social Media Engagement Timeliness Score: Cycle time to address stakeholder concerns, comments, sentiment, needs, preferences, etc. 7. Social Converter Score – Metrics on how well the company converts social engagers, social brand detractors and ‘brand interested’ into traditional prospects, brand advocates and brand customers respectively? 8. 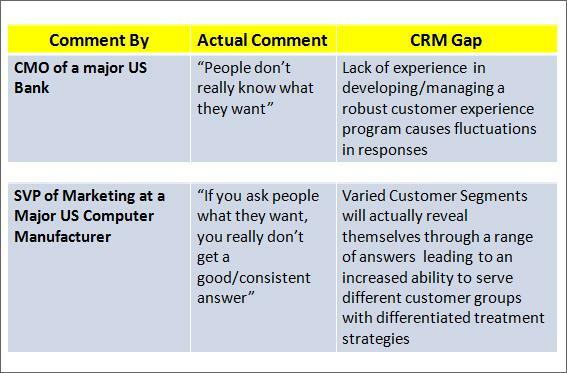 Social Media Program Value Score: Based on the Social Converter Score as a baseline, what is the current and cumulative value of the social media program and how has it delivered tangible value from a brand perception/value, prospect conversion, or customer (cross-sell, up-sell, higher share of wallet, etc) perspective. 9. Social Media Service Line Contribution Score: From a service line perspective (Sales, Marketing, Customer Service, Product Management, etc), how much has the social media program contributed in terms of sales lead increases, increased marketing reach and customer conversions, new product ideas (i.e. 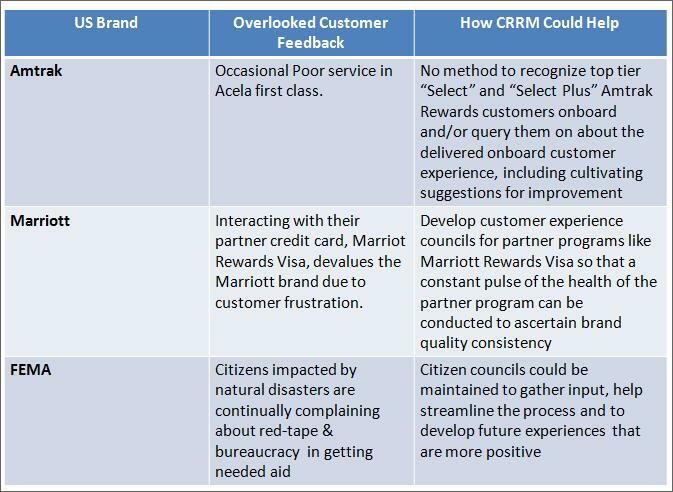 via Crowd Sourcing), customer service improvement suggestions or actionable feedback, etc. –Refer to service line specific metrics** below. or a Balanced Scorecard result of 2 (100/50). or a Balanced Scorecard result of .4 (40/80). The bottom line here is the best (balanced) score is when the program has a 1 to 1 ratio or a score of 100 for both external and internal metrics. This mirror effect indicates a well-balanced social media program that is considered world-class by the external program participants, yet is (internally) efficiently and effectively delivered by the company. 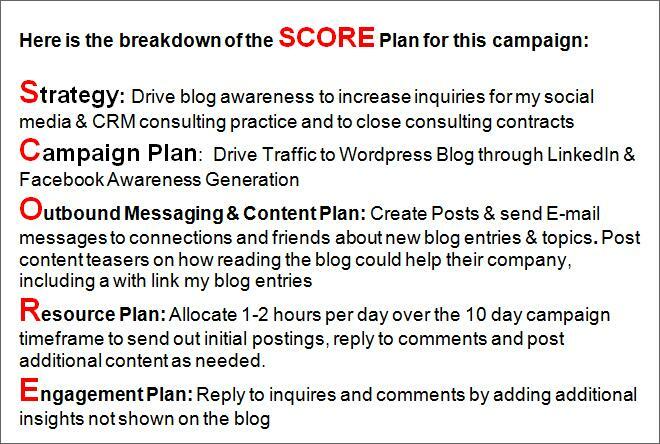 Obtaining a Social Media Program Balanced Scorecard score of 100, while somewhat demanding, can have a dramatic impact on the ability of your company to increase sales and market share. 4. Evolve metrics via continuous improvement – Evolve the metrics each year as to improve year-over-year performance in each metric category. • Social Media Community Lift: Number of community members acquired over a period of time into company community forums, communities, sites, etc. • Product Insight & Engagement Score: Score on the engagement with social media communities to source product ideas, implement feedback and suggestions for improvement and how well this feedback is incorporated back into the product life-cycle. 1) What are some of the critical social media measures, metrics and Key Performance Indicators (KPIs) you use to gauge the success of your company’s social media program? 2) How do you judge a great social media program? 3) What types of impressions do you have (i.e. what are the words come to your mind) of a company that delivers a great social media program? 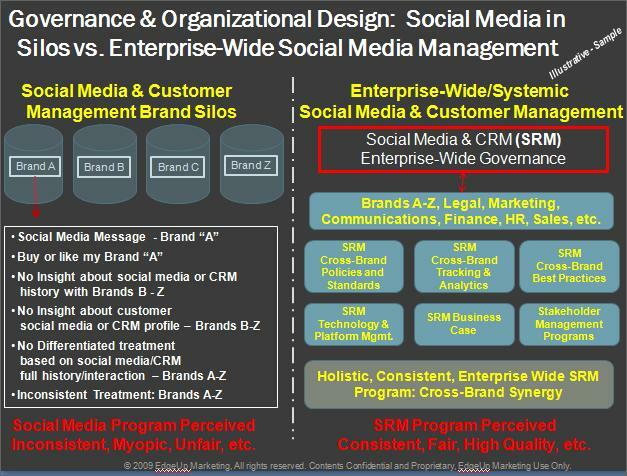 4) What are some other things companies can do to enhance the measurement of their social media program(s)?